Winter is a time when our body craves for richer and spicier food. The excesses of the festive period gives way to the intention of clean eating and everyone jumping on to the healthy bandwagon in January. Healthy eating does not have to be difficult to prepare and plan. It is also possible to add in flavours from the use of light spicing and aromatic herbs that gives you a more satisfying feel and impression of having a fuller meal. I have been looking at simplifying some of the dinner recipes at home recently and have also incorporated more vegetarian dishes as well as Fish, Turkey and Chicken in our diet. I had posted a recipe for a tasty Turkey and Chorizo Burger not so long ago. I have been revisiting some of the childhood dishes that I enjoyed while growing up in India like Chicken Stew and Khichuri ( Indian risotto with rice and mung beans). I plan to include some of this recipes soon. However I did experiment with the Chicken Stew recently and came up with this Chicken in a Miso Broth with Vegetables and Rice Noodles. Miso is a traditional Japanese fermented paste made from soya and rice or wheat or rye. It imparts a rich and deep savoury note to a dish whether you are making just a plain and simple miso soup or you could use the paste as a marinate. You can buy the Miso in a paste form many oriental supermarkets. 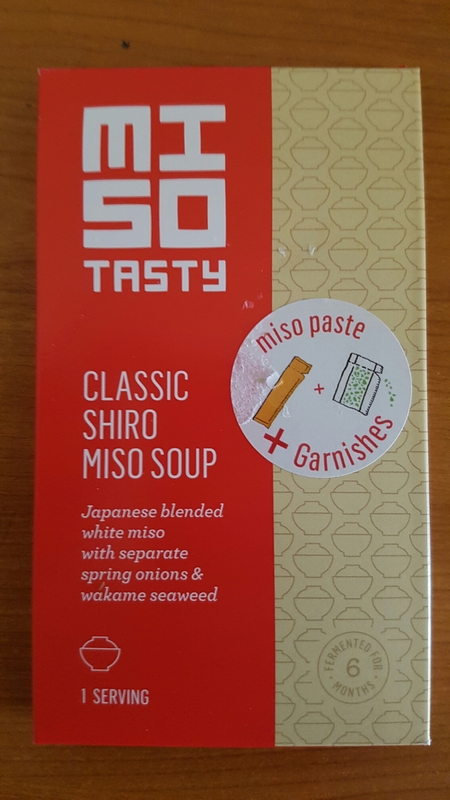 For my recipe for more simplicity I have used the The Classic Siro Miso Soup packets which are easily found in our British supermarkets. Heat a medium pan and add a teaspoon of oil. Add the Celery and the onion and fry for a couple of minutes. Add the Garlic and fry for another few minutes. Add the chicken and fry gently. Add about 500 ml of hot water and bring to a gentle simmer. Skim off any excess fat or the foamy mess if they gather on top. Add the vegetables and simmer for another 10 minutes before adding the paste from the Miso soup. Simmer for another 10 to 15 minutes till the chicken is almost done. Now take the chicken off the liquid and leave on a clean chopping board. Add the rice noodles into the broth adding more hot water if required. Stir gently and bring to a boil. Boil for a bout 5 minutes or according to the Rice Noodles packet instruction. De bone the chicken and a tear into small pieces. Add them back to the broth and add the Garnish part of the miso soup. Adjust seasoning. Garnish with sliced chillies and spring onions and serve hot. A simple nutritious pate packed full of healthy Omega 3 oils, this is easy to make and great spread on a crusty bread and on a crisp lettuce leaf. I have also used it as a sandwich filler served in pitta bread pockets. This dish is pretty unforgiving. You could try adding your own favourite things such as peppers, radish, spring onions, horseradish, capers, olives and so on and come up with your own recipe. This pate tastes great without any herbs but dill goes well with this or depending on your choice you could add chives, parsley or coriander too. How creamy or smooth you want it is up to you too. The following is a loose guide of the process rather than a strict recipe. Skin the fish and remove any visible bones. Break into flakes using a fork. Add the remaining ingredients except for the herbs and mix well breaking it into smaller flakes as you go along. Adjust seasoning and add the chopped coriander. Give it another good mix and mix in the lemon juice. You could mix this in a blender to give a much smoother texture but I prefer mine done like this. If you please you could also add 150 grams of crème fraîche and 100 gram cream cheese for a smoother and creamier texture. You could also blend half the fish and mash the other half with a fork. Serve with crusty bread or on top of salad. This post is long overdue. We as a family have been very busy in the recent months, relocating back to the UK from Jersey after living there for just over 2 years. It was not an easy decision and was not a easy move with a 6 year old in tow. One of the biggest challenge was to find a school place for our daughter and also to find jobs for ourselves. In the end things fell into place and we are settled. We as a family have focused on a slightly healthier lifestyle recently and we are watching what we eat and follow this up with a bit of regular exercise. So apart from cutting out some junk from our food we are looking into newer recipes and techniques. Its not too difficult but just requires a bit of advance planning. We are looking at ways to reduce our starch, fat and sugar intake. We have tried to incorporate Turkey meat in to our diet instead of red meat. Here’s a recipe of a Turkey Burger that I came up with. It can be prepared in the BBQ or inside the kitchen (grilled or fried as per choice). I added Chorizo to add a bit more flavour and it works well with the Turkey meat. Mix all the ingredients well (ideally by hand) and shape into 4 generous sized burgers. Leave it in the fridge for an hour. Heat oil in a pan and cook the burgers on it for about 3/4 minutes on each side. Now place in a oven proof dish and put in a preheated oven (180 degrees C) for about 10 to 15 minutes depending on how thick you made the burgers. I served mine on a whole meal flatbread topped with salad and Apple Slaw (recipe to follow), instead of traditional burger buns. You can serve them any ways you like. They are equally delicious served on their own with salad. I drizzled mine with yogurt and Sriracha Sauce. There is something about those chip shop curry sauce that is uniquely British and we love it in our chips bought from a chip shop. 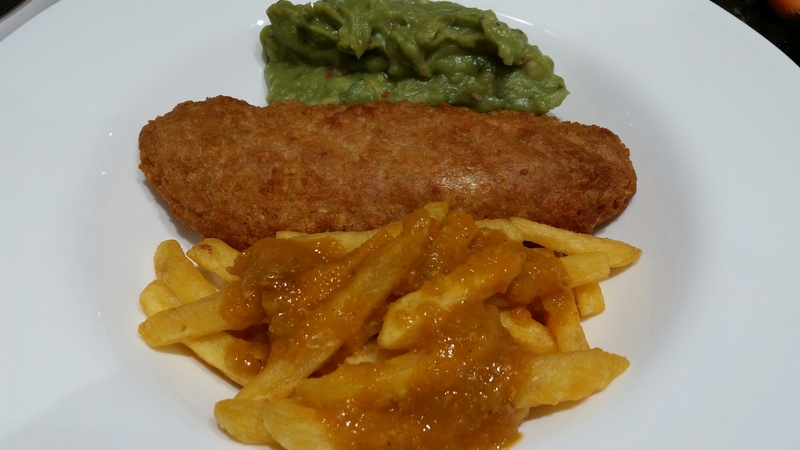 In our house no fish and chips dinner is complete without mushy peas (another British tradition) and curry sauce. Here’s a simple recipe to make your own. The result is fantastic. Heat the oil in a saucepan, and add the onion, apple and garlic. Cook over a medium heat for 5-10 minutes, until everything is very soft. Add the curry powder and mix well. Then pour over the water and add black pepper. Bring to a boil amd simmer gently for around 10 minutes, stirring every couple of minutes. Now add the cornflour (mixed in some cold water). Simmer till the sauce gets thicker. Use a hand blender to break down the chunks and smoothen the sauce. Depending on your taste you can make it completely smooth or leave a bit of texture. Heat it well and serve with chips. My first introduction to Portuguese food involved Bacalhau (salted Cod) in a restaurant in Vauxhall in London and I was hooked. 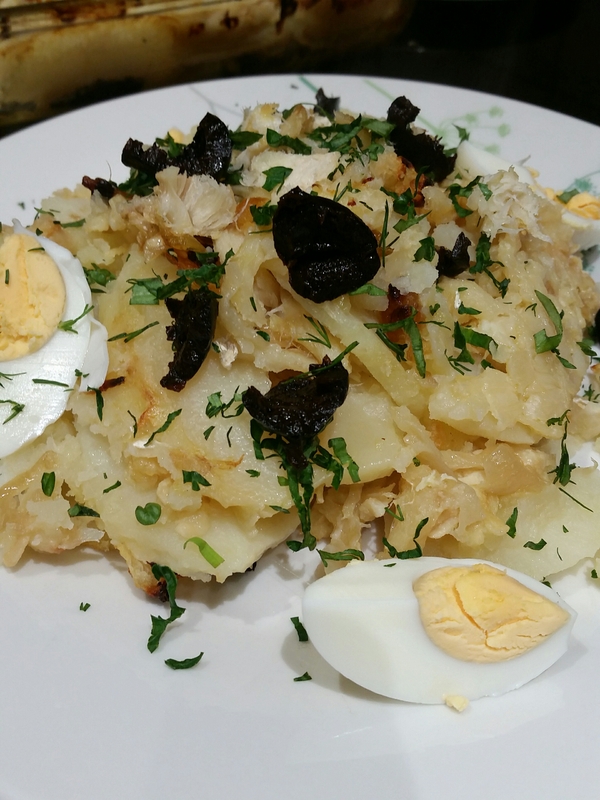 Over the years, I have had the good fortune of trying various including some excellent home cooked versions of Bacalhau and I think that this one originating from the Northern city of Porto is my current favourite. Bacalhau is considered to be one of the most important Portuguese food item and its evident from its popularity in Portuguese colonies such as Brasil, Angola, Cape Verde, Macau, and Goa. Its also commonly used in Galicia region of Spain. 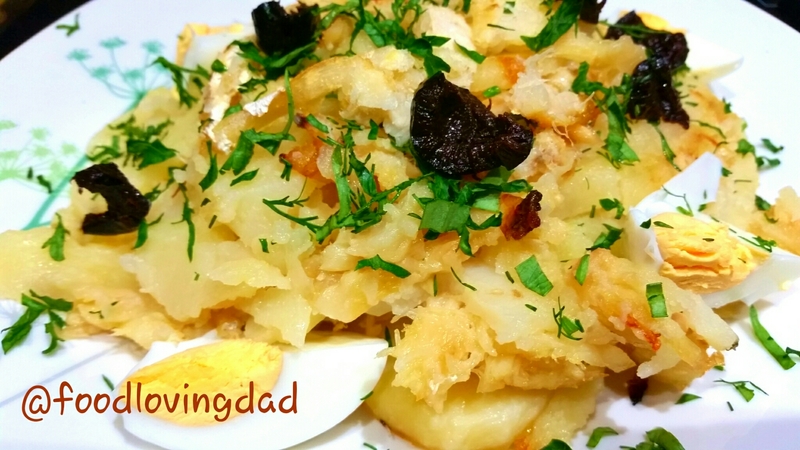 Bacalhau is traditionally prepared in most Portuguese household during many celebratory dinners including Christmas. This dish takes a tiny bit of advance planning as regards to soaking the fish but from there on its a easy enough process and chances are that you would love the end result. Its essentially described as a casserole of Salted cod with potaoes and onions. Soak the cod in water for 24 to 36 hours and change the water about every 8 hours. Drain the cod and flake into smaller pieces discarding any bones. Bring milk to a boil then turn off the heat. Cover the fish in the warm milk and let it infuse for about an hour. Drain and set aside. Preheat oven to 180 C. Peel and cut potatoes in 1/4 inch thick slices. Gently boil for about 5 to 10 mins, till tender but able to hold their shape. Drain and set aside. Fry the onions in a generous amount of oil till soft and translucent. Add the garlic and continue cooking for about 2 to 3 minutes. Take it off the heal and set aside. Oil a oven proof dish with oil. Add layers of potato, drained cod, and the onion garlic mixture, in that order till you use up all the ingredients, seasoning with salt and pepper as you go along. Spread olive oil on the top and bake in the oven for about 40 minutes. Garnish with quartered or sliced hard-boiled eggs, chopped parsley and black olives. Serve immediately and ENJOY! I have been absent from this blog for a long time. There have been some major changes for me. I have a new job now working Monday to Friday and we have moved into a new house. Working routine hours over set days might have its advantages but after having worked varying shifts for the past 17 years I am still adjusting my life around my new routine. My cooking priorities have changed slightly and I am learning to make the most of my time available. By the time I have some dinner prepared I don’t have much natural light left to take nice pictures too. So blogging took a bit of a back seat but I am determined to get back to it. I was thinking about what recipe to post for a few weeks. The answer came to me as I was looking though some old pictures on my mobile phone. Couple of years ago around this time, I was in America touring the east coast from Virginia to Boston. 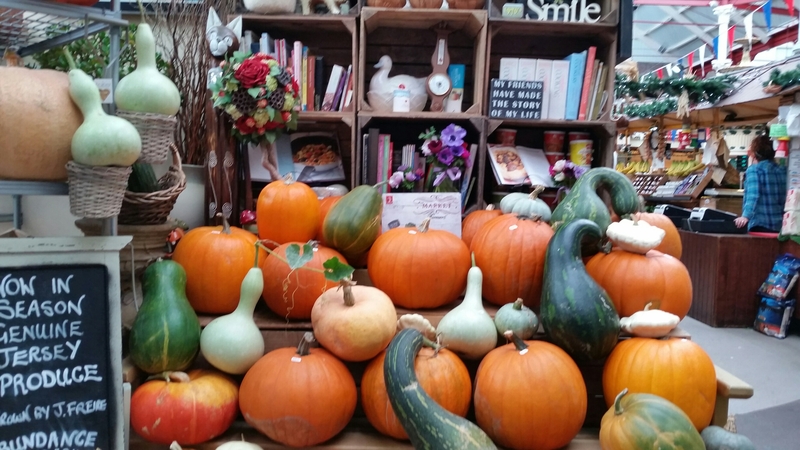 Everywhere we visited there seemed to be an abundance of Pumpkins as they were gearing for Halloween. As I was talking to my friends and relatives there, I was surprised to hear that even though they were all familiar with Pumpkin Pie and Pumpkin Spiced Latte (a popular seasonal export by Starbucks), they were shocked to hear that Pumpkin could create a great soup. 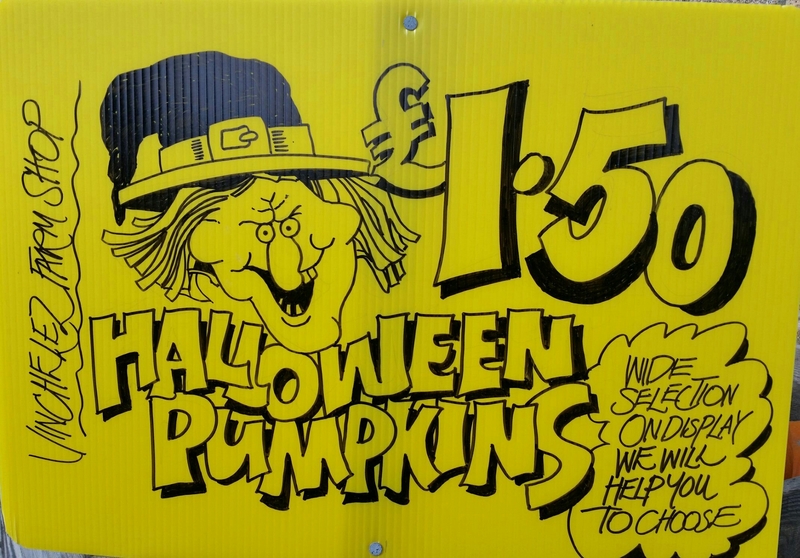 I remember that in those 15 days I had to make (at least on two occasions) pumpkin soup. Now in a land of plenty such a hearty soup should be a part and parcel of Autumn life. It’s surprisingly versatile and can absorb a lot of flavour. I have a few versions (ie with Chorizo, with Goats Cheese, with Lentil, with crab meat and so on) but for this recipe I will like to write about Spiced Pumpkin Soup with Coconut. 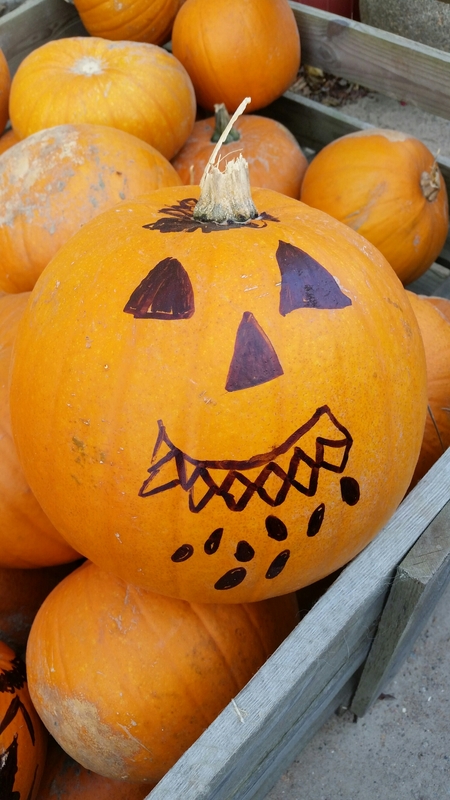 The pumpkin could be easily replaced by Butternut Squash as I often do but at this time of the year stick with pumpkin. Heat oil in a saucepan. Add the star anise. Add the chopped garlic and chilli. After about 30 seconds add the chopped onion. Fry till translucent and add the pumpkin pieces, cumin and coriander powder. Stir for a minute or two before adding the coconut milk and some water to an inch over the pumpkins. Bring to a boil and simmer gently for about 20 minutes. Check that the pumpkins are completely soft. Blend the soup using a hand blender. Check for seasoning and add a bit of water if necessary for the desired consistency. Simmer gently for a few minutes. Add a squeeze of lime and the chopped coriander. Serve hot. We are in the middle of July when the weather is supposed to be in the thirties and Sunday afternoon alfresco dinning or a picnic in the beach should be the order of the day. But instead we have temperature barely touching 20 degrees Celsius. Today was a cloudy day that was threatening to rain for most of it and the rain finally came around 4pm. The town was hosting a festival over the weekend. I took my daughter there on Saturday but the weather did not allow us to stay up there for long. The last two weeks have been like this and the body is craving for some comforting food. We knew that we had to ditch the salad and we did not fancy a full on roast. So we decided to make this stew instead. I have made it a few times before and it works a treat. Lamb is my favourite meat and it is best cooked in a curry or stew. This is a very tasty alternative for a Sunday roast and I would say that its a lot easier too. Try and get Rose Harrissa paste as its bit milder and more flavourful (with the addition of rose petals). If you want this dish extra hot then add a couple of teaspoons of chilli powder. I have added dates as I had some in the fridge. This is optional but adds a different layer of flavour. You can use chopped dried apricots or even a few sultanas instead if you do not have dates. I have also added a tablespoon of anchovy paste (optional) that brings out the flavour of the meat. You can also used chopped preserved lemons to this dish. I have also used a tin of Cannellini beans for the dish in the picture as I ran out of Chickpeas but it works well too. 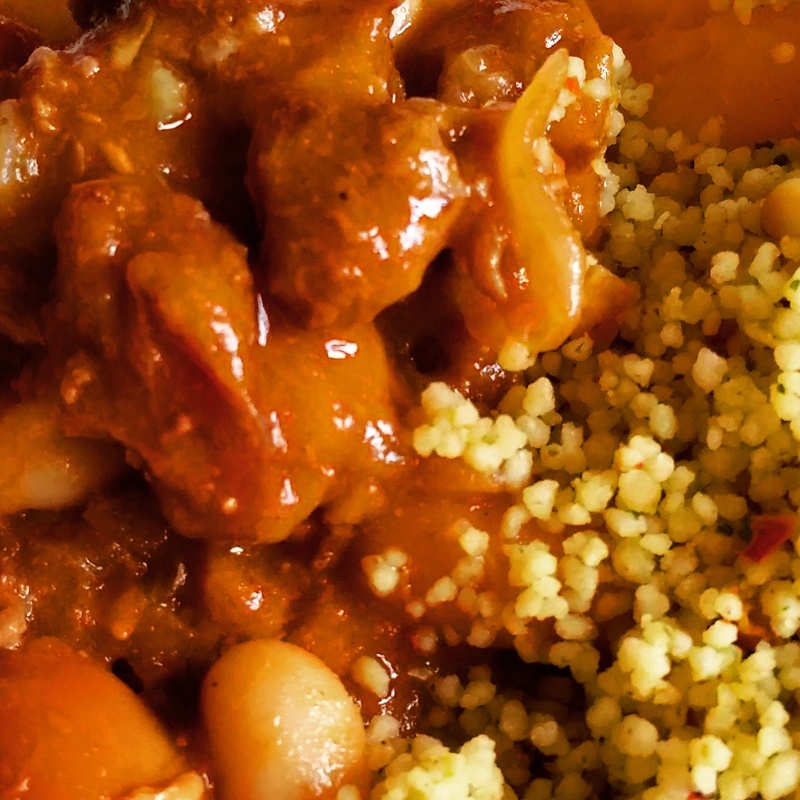 In a bowl mix the lamb with the cumin and coriander powder. Heat oil in a casserole dish and brown the meat in two batches and keep aside. Now add a bit more oil in the same pan and fry the onions till translucent. Now add the Garlic. Fry for a minute or two and add the bay leaf and cinnamon. Now add the meat, the tomato purée, Harrissa paste and Anchovy paste (if using). Add the extra chilli powder if using. Mix well and add the white wine. Add salt and bring to a boil. Reduce heat cover and cook in a 150 degree Centigrade oven for about 1 hour and 15 minutes (the meat should be well cooked by this time). Take it out after that time and add the chickpeas and dates or apricots and cover and cook for a further 20 to 30 minutes. Alternatively you can slow cook this dish on a very low flame for about the same time as the oven. Check Seasoning and Serve hot with Couscous or Sweet Potato Mash or some Flatbreads. 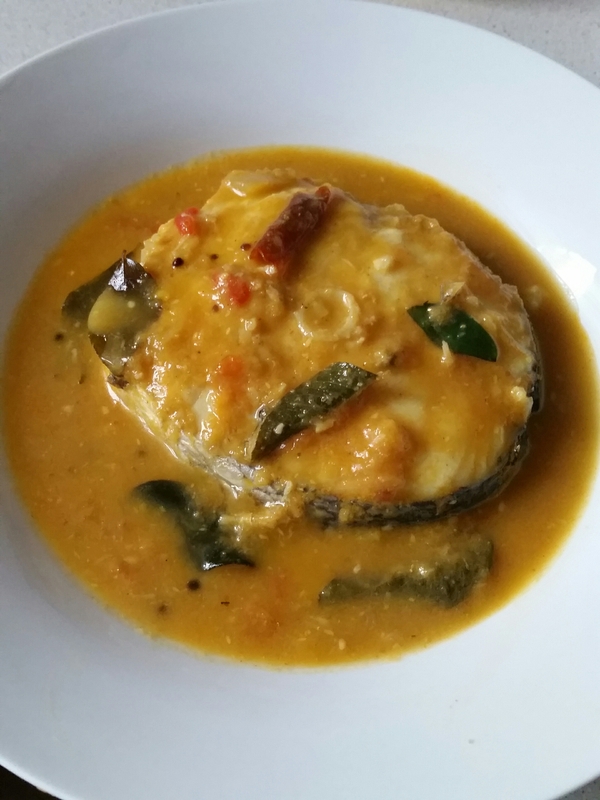 This is my version of a generic South Indian style Fish Curry using staple South Indian spices such as mustard seeds, red chilli, curry leaves and coconut. These along with the other ingredients are very easily available in supermarkets outside India. This dish is quick to prepare and is a lighter curry that can be enjoyed during the warm summer months when you need a curry fix. For my last attempt (pictured) I have used Hake Fish Steaks but any firm white fish will do. I have used Cod, and Monkfish before. See what you can get fresh on the day. If you have or can get your hands on to some tamarind paste, use a level tablespoon (tbsp) of that instead of the lemon juice but add that just before adding the fish. Marinade the fish with salt and and leave for about 30 mins. Heat oil in a pan and add the red chilli, mustard seeds and once they start to splutter add the onion paste. Stir over medium to high heat till it changes colour. Now add the curry leaves and the ginger garlic paste. Stir for about 2 to 3 minutes till the raw smell disappears. Add the spices with a little water and stir well. Add the chopped tomato and stir for about 5 mins till the whole thing turns somewhat pulpy. Now add the coconut cream. Stir the mixture well. Check seasoning. Add a little water if required before adding the fish pieces so that they are just covered. Cook for about 4 to 5 minutes (depending on the size and thickness of the fish) on a medium flame till the fish is done. Check Seasoning, add lemon juice. Top it with dessicated coconut (if using) and serve immediately with plain rice. Rice pudding is popular the world over loved equally by kids and adults. In India all birthdays and other auspicious occasions are always celebrated with comforting home cooked Rice Pudding. There are different short grain rice that are used specially for the purpose. In the UK some of these short grain rice is now widely available but I have used Brown Basmati rice here but this dish can be made with any rice that you have in your cupboard (just adjust cooking time, white rice should take a bit less time to cook). I had a bag of Brown Basmati rice in my store cupboard for a while (have not grown to like the taste to be had with regular food) and decided to make this version of the rice pudding after watching something similar on TV while I was in India during February. I have to say that the brown rice here adds a bit of nutty flavour and the sweetness from the milk and the flavours of the coconut and cardamom all works well together. Pulse the rice in a food processor to break them up a bit but do not powder them completely. In a heavy bottom pan bring the milk to a boil. Add the rice and stir well. Add the sugar, coconut and the cardamom and stir well. Bring to a boil and simmer gently for about 30 to 40 minutes (less if using white rice) stirring often till the rice is cooked through and all the milk had been absorbed. Serve warm or cold as preferred and Enjoy. You can garnish this dish with Cashew nuts or roasted flakes of coconut but its nice as it is too. Children love playing with dough and my daughter is no exception. They also love pizza. Why not combine both of those and make your own pizza. Its easier than it might sound produces excellent results. We make our dough at home using fast acting yeast and after kneading the dough and while we let it rest for the rising I give a little dough to my daughter to play with. This keeps her occupied while the yeast does its magic. You can make your pizza dough the traditional way by just using white bread flour or mix its with wholemeal flour if you wish. I have played around with the flour mixture many times but have settled for the following amount. The amount below makes three or four medium sized pizzas. In a large mixing bowl shift in the flour. Add the yeast and salt to it. Make a well in the middle and add the olive oil and the water . Slowly using a spatula or your fingers bring in the flour from the outside into the liquid in the middle. Keep mixing till it kind of comes together. Now pour it over a floured work surface and using a floured hand knead the dough well stretching as you go along. Do this for about 10 mins until you have a very smooth and elastic dough. Form into a ball and keep covered in a floured mixing bowl covered with a damp cloth for about an hour or so until it has doubled in size. Now gently tip out the dough from the bowl onto a floured work surface. Using your fist gently knock out the air from this dough. Now divide this mixture into 3 or 4 portions. Dust with a bit of flour on top. Form the individual portions into a smooth tight ball using circular motion of the palm of your hand. 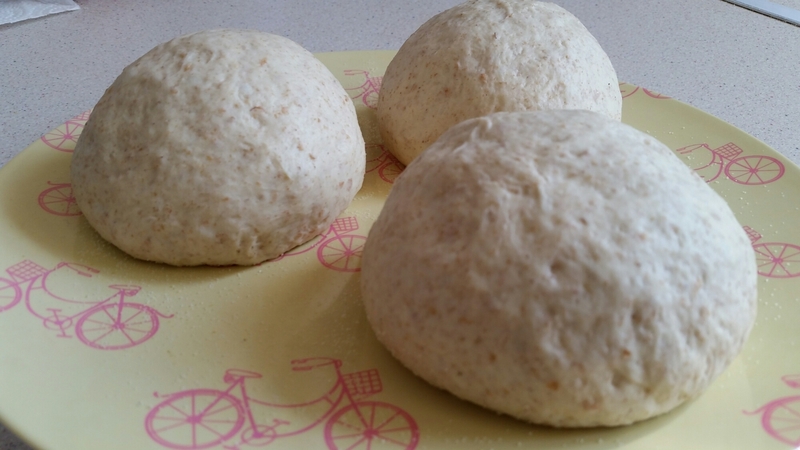 These dough balls can be used straight away or can be stored in the fridge (it will still grow, but slowly) or in the freezer (freeze them as quick as you can and it will stop the growing process). ps. I use semolina at this stage. Dust a bit of semolina on the work surface and place this dough ball on. Now dust a bit of semolina and flour mixture on top and roll the dough out. The semolina does a better job of making sure that the dough do not stick to the work surface and the cooking stone or plate and also gives the final pizza a nice crunch.